This Privacy Statment discloses the privacy practices for www.matchgrademachine.com. Privacy notice applies solely to information collected by this website. Thank you for entrusting Match Grade Machine with your personal information. We are the sole owners of the information collected on this site. We only have access to collect information that you voluntarily give us via email or other direct contact from you. Your information will not be sold or rented to anyone. 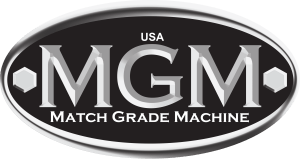 Match Grade Machine will use your information to respond to you. Regarding the reason you contacted us. We will not share your information with any third party outside of our organization, other than as necessary to fulfill your request.